Solid-phase extraction (SPE) is a sample preparation process by which compounds that are dissolved or suspended in a liquid mixture are separated from other compounds in the mixture according to their physical and chemical properties. Analytical laboratories use solid phase extraction to concentrate and purify samples for analysis. Solid phase extraction can be used to isolate analytes of interest from a wide variety of matrices, including urine, blood, water, beverages, soil, and animal tissue. SPE is a column chromatographic analysis process bearing much similarity to high performance liquid chromatography (HPLC) in the mechanism of separation and choice of reagents and solvents. When a sample passes through the extraction column filled with a sorbent, a part or all of the constituents interact with the sorbent and are retained in the column. A solvent or mixture of solvents is then used to wash out interferences. The target analyte is then quickly eluted out of the column by a desired solution of reduced volume. The goal of fast separation, purification, and concentration is therefore achieved. SPE can be carried out with various types of sorbents to perform extraction and separation of different analytes. Depending on the nature of the sorbents, SPE extraction materials can be divided into normal phase sorbents, reverse phase sorbents and ion exchange sorbents. Washing: Use a solvent with proper strength for washing the extraction column. The purpose is to rinse interferences through the column while leaving the target analyte in the column. To reach that goal the strength of the solvent should be strong to remove the absorbed interferences, but also weak enough to leave behind the retained analyte. A commonly used solvent for washing is water or a mixture of water and organic solvent. Elution: Use a solvent or mixture of solvents capable of eluting the target analyte off the sorbents. This step has a strong effect on the recovery. It requires an accurate control of the amount and flow rate of the eluent to ensure the reproducibility of the separation. The strength of the eluent is also important. A strong eluent may remove some intentionally retained interference, whereas a weak eluent may not break up the retention of the target analyte on the sorbent. To increase the analyte concentration or change solvents, the collected eluent containing the target analyte can be dried by blowing nitrogen over it and then re-dissolve the analyte in an appropriate solvent. 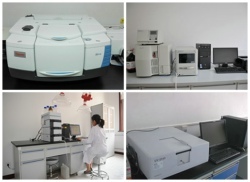 Solid phase extraction has been widely and increasingly used in chemical analysis and purification. It has become the most popular technology of sample preparation. It is employed primarily in purification or concentration of samples before analysis in gas chromatography and liquid chromatography. SPE initially used bonded silica gel as the base sorbents. As technology evolves, polymer microspheres for SPE sorbents are gaining popularity and acceptance because of the shortcomings of bonded silica such as poor pH stability and low absorption capacity.